Just in time for the holiday season, a digital edition of The Marian Miner Cook Athenaeum Cookbook was sent to the members of the College community in early December. Did you have a chance to make the Ath recipe for Rice Krispies treats? Or Professor Marc Massoud’s recipe for Baba Ghanouj? A print version of this cookbook (which grew from an Ath dessert cookbook originally created by Anne Marie D’Agostino ‘91 when she was an undergrad) will be made available this year. Over several days, the Ath’s own Chef Dave carefully tested the recipes in The Marian Miner Athenaeum Cookbook (to ensure that no ingredient was overlooked). 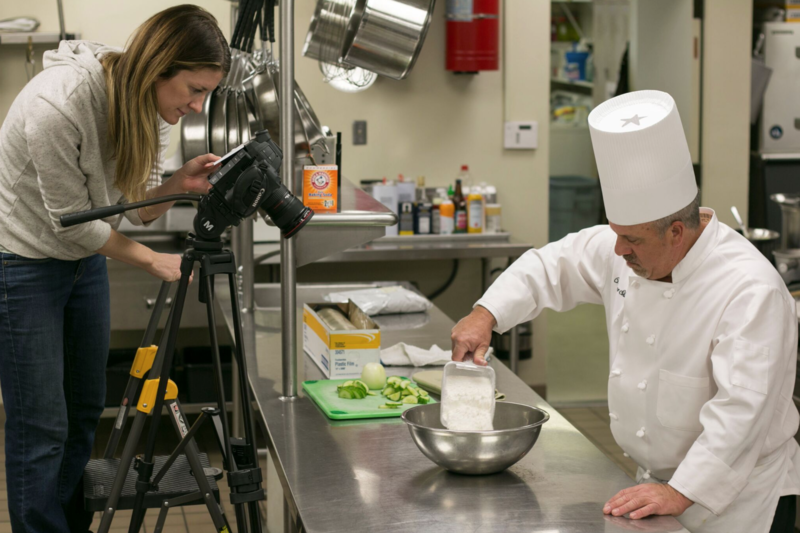 Each prepared dish was then arranged and photographed by Garrett Richardson; some dishes received a friendly touch-up from the Alumni Office’s Darrin Roberts. As dishes were prepared, CMC’s Director of Video Production Cameron Grimm (Scripps ’06) also filmed the steps for the accompanying holiday video.